You all know that I’m one of those weirdos who really liked Final Fantasy XIII, right? I just wanted to make sure we got that out of the way first. It’s definitely not a game that everyone can appreciate, but I found a lot to like about it. Most of the characters were well developed, the setting was really unique, and the music was absolutely wonderful. One of the few things that FFXIII fans and not-fans agree on is that the story is bad. I don’t agree with this. I think that FFXIII had a fine story (not great, but I found it interesting enough), the big problem is that it was told very poorly. The storytelling was disjointed, looped in on itself several times, and even omitted a bunch of details. Most of the key points could be found in the optional in-game datalogs, but if players have to read a bunch of supplemental material to understand your story, you’re doing it wrong. Final Fantasy XIII-2 took a lot of complaints about the first game and tried to rectify them, but ended up mucking up other things in the process. They tried to make the story easier to follow, but they did that by over-explaining it in countless repetitive cutscenes. Also the story in FFXIII-2 was more complicated, because it revolved around time travel and multiple magic realms and reincarnation, and again important details were omitted completely. I won’t deny that by the end, I really wasn’t sure what happened. The very good news is that with Lightning Returns, Square-Enix learned that the best way to close off the trilogy was just to simplify the story. It’s quite basic: at the end of XIII-2, the big bad essentially breaks the world and time for humankind. so now nobody is ever born and nobody ages. It’s been like this for 500 years, and the world is about to implode into itself. Lightning’s job is to soothe the souls of as many people as she can (generally by collecting trinkets for them), which will allow them to be reborn on a new world when the current world goes kaput. Of course, Lightning doesn’t really give a whiff about the souls of the world’s population, she’s just doing it because God’s promised to bring her sister back to life if she does a good job. I won’t spoil it, but if you’ve ever played a Japanese RPG before, you probably have a good idea of how it turns out. But those are the broad strokes of it, and there aren’t really any major twists until the very end. It’s very straightforward, which is a nice change of pace for the FFXIII series. It’s not a particularly compelling plot though. The upside is that the game is split into five main quests, and each one of them follows its own story, which are far more personal and much more interesting than the core plot. The really fun part is that you get to do these main quests in whichever order you see fit; the game is completely open-ended, and you’ve got free reign to choose to play it however you like. The game’s world, Nova Chrysalia, is split into four continents: the cities of Luxerion and Yusnaan, the Wildlands, and the Dead Dunes. After an intro dungeon and a half-day that serve as an extended tutorial, you’re free to roam the entirety of the world. There’s a whole lot to see out there, and besides the five main quests, you’ll also be completing sidequests for dozens of people spread across each region. Add that to the huge list of tasks assigned by the Canvas of Prayers (maintained by none other than Chocolina), and you’ll have your hands full trying to save as many souls as you can. There’s a catch though: the game has a very strict time limit. You’ve only got six days to reach your goal. Completing each main quest will tack another day on there, though, and you can extend the total count to 13 days if you complete enough sidequests as well. In fact, you must get to that thirteenth day if you want to actually beat the game. Now, this can sound like a lot to take in. The game itself even warns you over and over that you won’t be able to save everyone in the time you have. It’s totally lying to you though. I did it. If you play your cards right, thirteen days is way more than enough to satisfy the needs of all the people in the land. You even get a time-stopping power early on that halts the clock for a couple minutes. If you abuse this power (which is very easy to do), you can have pretty much everything wrapped up by Day 8 or 9. I’m sure min-maxers have already gotten it even lower. The time limit is a really nice feature for an open-world game like this, though. It urges you forward, making sure that you don’t get bored by dawdling around for too long. At first it seems like a stressful pressure, but once you realize how generous it actually is, it’s just a nice way to keep you on the right track. Though I appreciate many of Lightning Returns’ features, the crown jewel is absolutely the battle system. While the previous FFXIII games sort of put you in the backseat of the battles, mostly just telling your guys which formation to be in, Lightning Returns puts you in full control of the battles. This is done by narrowing it down to just controlling Lightning throughout the entire game. Parties and paradigms are gone, but in their stead, you have full control of Lightning’s actions in battle. 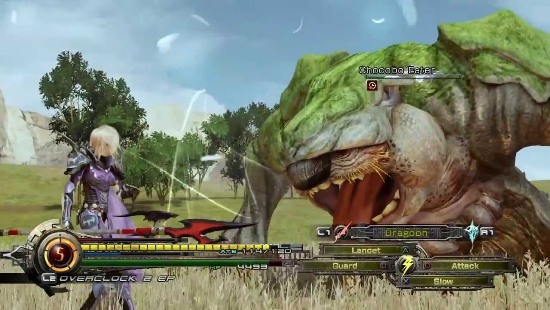 It is an FFXIII game though, so there is a system reminiscent of the previous games’ paradigms. The schemata system gives you three different equipment and ability sets for Lightning to flip through during battle. Each one is made of a garb (costume), a weapon, a shield, and two accessories that define Light’s stats, and four abilities for her to use in battle. Using this system, you can customize Lightning’s fighting style however you choose. Of course, you’ll have to keep in mind your enemies’ weaknesses, but still, you’re given a ton of freedom in how you want to play. Fights are mostly one-on-one, but occasionally two enemies will team up or you’ll have to take on a horde of weak monsters. Surprisingly enough, battles are also mostly an optional exercise in this game. It’s important that you fight because monsters are your main source of new abilities, but you could theoretically find enough to get by in treasure spheres. The only reason you have to fight is to collect monster bits to complete quests. And completing quests is important because that’s how Lightning levels up. You don’t gain experience points at all, but rather each completed quests gives you a predetermined set of stat boosts. So if you can pretty much just avoid fighting anyway, why bother completing quests to level up at all? Bosses. Obviously, the boss of each main quest is an unskippable fight, and they are tough. I had to fight the first one three time before I beat him, and even then I only scraped by with a sliver of health. And that’s pretty much how they all went. A word of advice if you decide to play the game in the future: spend a couple days just doing sidequests and beefing your stats a bit before tackling a boss. My biggest mistake was panicking because of the time limit and trying to do all the main quests as soon as possible, and I suffered because of it. Lightning Returns also features a New Game+ mode, something the last two games didn’t have. But it only makes sense here, letting you keep your character progress if you run out of time. It’s very similar to how Dead Rising works. 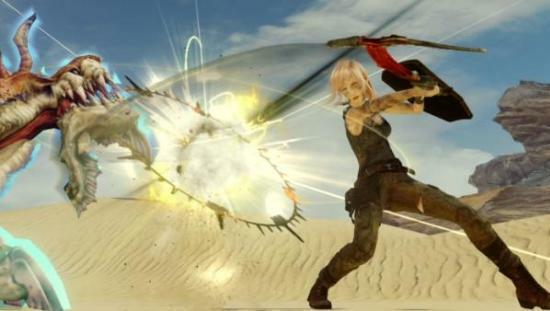 Lightning Returns also gives you a few bonuses through NG+, mainly the ability to forge your weapons to increase their parameters. It also gives you an improved version of any accessory you find a copy of, and unlocks Hard mode. Hard mode is kinda dumb though, as it’s the only way to get the best materials for improving your weapons and abilities. It’s fair, but still dumb. 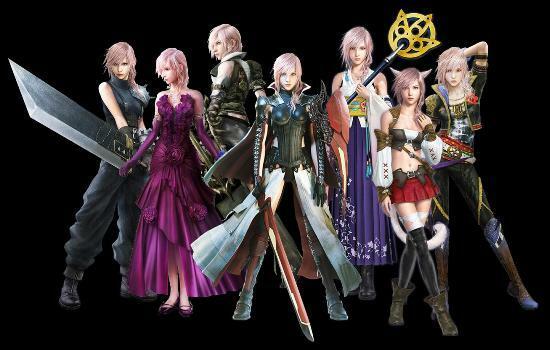 So, what didn’t I like about Lightning Returns? The biggest one is obviously that there wasn’t enough Sazh. I still think that he should get his very own spin-off game, but what can you do? Also, while the story is refreshingly straightforward for an FFXIII game, it’s pretty dumb and by-the-numbers. We’re talking JRPG 101 here. Not to spoil, but the Power of Friendship is a big deal here. Oi. I really can’t think of much else to say, other than the fact that this is far and away the best of the Final Fantasy XIII trilogy. If you didn’t like them before, Lightning Returns probably isn’t going to change your mind, but it’s a wonderful evolution of the formula, and I feel that it’s really worth a go. It’s also a hell of a lot shorter than either of the other games, clocking in at about 40 hours if you plan to simply get from beginning to end and watch all the cutscenes. If you do intend to wring out every last bit of content, you’re looking at somewhere around a 65-hour investment. It’s great though. I enjoyed every minute of it.